P.K. Mansion is a nice enough place, just up the street from the beach and surrounded by numerous shops, restaurants and clothing stalls, selling everything from the classic Thai pants, to bikinis, to carved wooden elephants. There is also a more commercial line of restaurants up the road that includes McDonalds, Starbucks and Subway if you’re feeling like something western for a change. When we arrived and checked in, we found the staff a little rude and abrupt, although this may have just been a language barrier thing. We were given our key and up we went to to the third (top) floor to room 307, a room with a double bed and one single, an ensuite bathroom, TV and fridge. It had both air con and a fan, but we went for the cheaper option of the fan, so the A/C was turned off for the duration of our stay. The room also had a little balcony, overlooking the hotel’s entrance, so not a great view but quite a nice place to just chill, or go for a smoke, if you’re that way inclined. 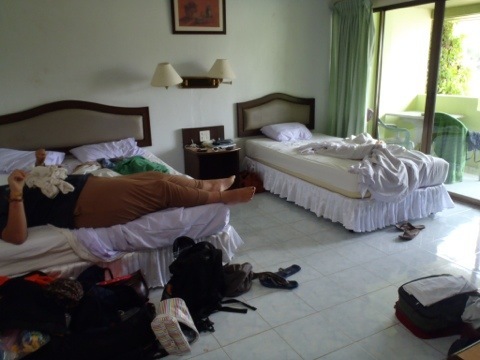 For this room we paid 1100 baht per night (about £22), which is a pretty good deal, considering the rates of some of the other place in the oh-so touristy Ao Nang. Downstairs the hotel has three computers available for a small charge but no WiFi (which is fine, as many of the restaurants along the beachfront offer it for free), as well as a book exchange system (which would have been very handy, had I not left my finished book in Koh Phi Phi!). They also serve breakfast, with a whole host of different options, and for not too high a price. All in all, it’s a perfectly pleasant place to stay, and the staff did seem much nicer on our departure than when we arrived, asking us to come back soon…maybe I will!